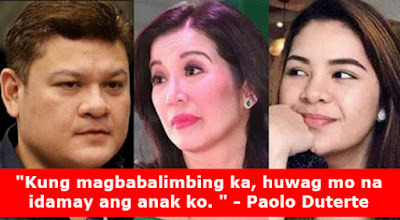 Former Davao City Vice Mayor Paolo “Pulong” Duterte criticized Kris Aquino on Monday, April 23. This is after the Queen of All Media tried to reach out to his daughter, Isabelle Duterte in a reply to a comment on her recent Instagram post, where he mentioned President Duterte (Isabelle’s grandfather) deserved his win in the 2016 elections. Last Sunday night, Kris slammed Korina Sanchez for airing at her show Rated K an interview with James Yap and his pregnant Italian girlfriend Michela Cazzola. According to her, it was a slap on her face. She added that President Duterte was very kind to her when she visited Davao City during the 2010 and 2013 elections, and a taping for KrisTV. Because of this, Kris received tons of mixed reactions from netizens. Some of them agree with her, while her bashers said that she could have talked to James privately, and that she only wants to be controversial again because she will do a movie at Star Cinema. Meanwhile, Isabelle did not comment and instead left an emoji heart. “I have long wanted to reach out to you because I know what it is like to be bullied. I also wanted to tell you from my own life experience, though you don’t know me & may say it’s none of my business — from what I read about your dad wanting you to be get a good education — he was making a valid point,” Kris wrote as a reply to Isabelle Duterte. “You are beautiful. And somebody with your looks will be lethal when she has graduated from college. If you ever want to seriously consider a career in entertainment a GO – I’m easy to find & would enjoy getting to you know you,” she added. 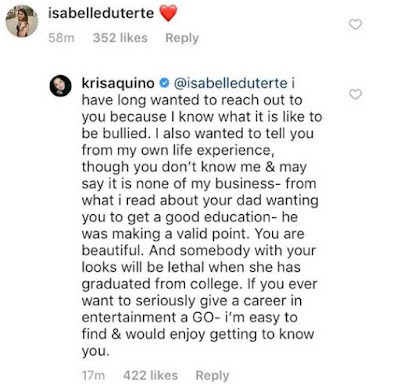 Isabelle Duterte did not comment further, but her father Paolo seemed to be not pleased and warned Kris Aquino. “Kung magbabalimbing ka, huwag mo na idamay ang anak ko. Kung galit ka sa mga akala mong kaibigan mo, sila na lang ang kausapin mo. Yung alok mo nga pala sa akin dati na kape o beer, ikaw na lang mag-isa. Wala akong panahon sa mga gaya mo.” Paolo Duterte told reports in Davao City, when asked about Kris’ comment to his daughter.